Exetel has agreed to fund this dedicated group of volunteers in their work to attempt to arrest the decline of the Black Cockatoo populations in Western Australia. The Black Cockatoo Rehabilitation Centre (BCRC) “KAARAKIN” is a small voluntary group who rescue (pick up) injured/sick wild Black Cockatoos from anywhere in WA and transport them to Perth Zoo for specialist medical care. 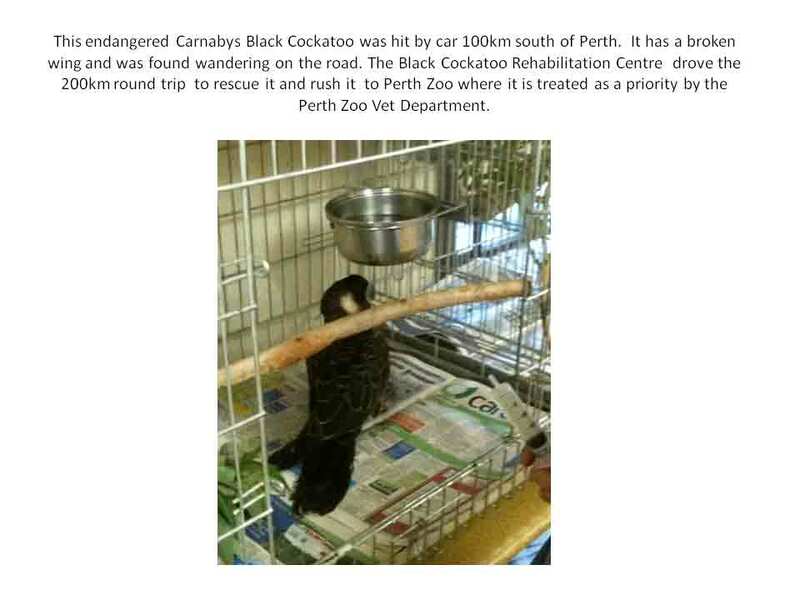 After initial treatment at Perth Zoo, the bird is released back to the BCRC facility for rehabilitation, until being released back into their family flock. We have travelled over 70000kms since July 2007. 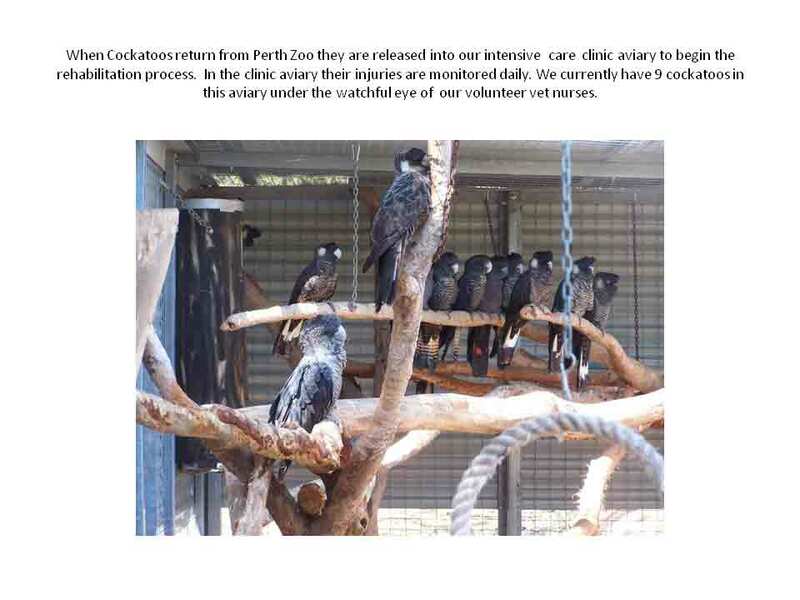 Everything they do with the birds is approved by the Department of Environment and Conversation (DEC) and they work closely with the Senior Wildlife Officers from DEC, and with the Perth Zoo Veterinary Unit. They are Registered Wildlife Rehabilitators (DEC). 1)	Rescue, Rehabilitate and Release Black Cockatoos. 4)	Coordinate approach to Black Cockatoos. 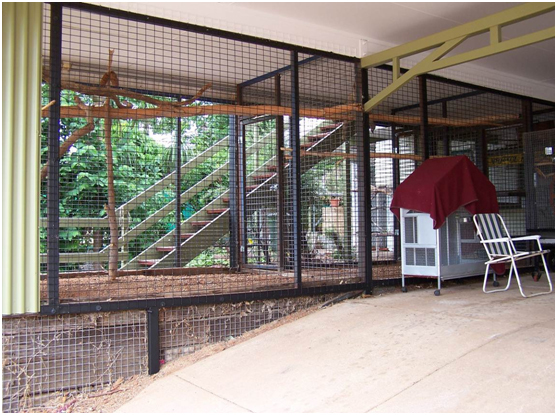 5)	Provide an education and learning centre for the study of Black Cockatoos. 6)	Provide a research facility in all aspects of Black Cockatoos. 7)	Raise money and property for the preservation of Black Cockatoos. Establish strategic partnerships with stakeholders. 10)	To provide a coordinated approach to the management of Black Cockatoos. 11)	To form MOU’s with key stakeholders. 12)	To encourage sustainable development. The four species of Black Cockatoos are unique to the state of Western Australia. They are listed by DEC as Schedule 1 - Fauna that is rare or is likely to become extinct. This is due to declining habitat and food sources, both in quantity and quality, as well as declining numbers of individuals. This organisation is recognised as being world leaders, who have set new standards with Black Cockatoo release by the identifying the unique interaction between Black Cockatoo’s and their family groups, enabling the successful release of rehabilitated birds back into their own family group who readily accepts them. In May 2008 they released 21 Black Cockatoos back to their family group, which makes a total of 79 black Cockatoos released back to their own family groups since July 2007. They have rescued 203 birds in that time and currently have 81 in care. They also provide education and awareness to the public and individuals on black cockatoos: distribution, habitat, food, conservation status, and also the functions of the BCRC. Will this project be added to the Customer Donation page so customers can also contribute? Also, I notice the species specific animal projects supported by Exetel are all for birds, Gouldian Finch, Regent Honey Eater and now the Black Cockatoo. Are you looking at non-bird projects. flak wrote: Will this project be added to the Customer Donation page so customers can also contribute? The changes should be made by COB today. The Wadderin Sanctuary and Southern Ark projects are for animals, one reptile and one crayfish and the Spiny Daisey project is, understandably for a plant. The next project we will be supporting will also be a bird - The Western Ground Parrot - also in WA (though Steve has had no input in to the project selections). We look for diversity in our sponsorships and would happily include any community based project that assists any Australian flora or fauna have a better chance of surviving so we tend to stay with endangered species. We have yet to find a NSW project to sponsor so we would welcome any suggestions. ForumAdmin wrote: We look for diversity in our sponsorships and would happily include any community based project that assists any Australian flora or fauna have a better chance of surviving so we tend to stay with endangered species. Would you consider sponsorship of programs which support the wider ecosystem within a specific environment or locale such as education, bush regeneration or weed removal? It would depend on the achievable benefits. Firstly we would like to thank EXETEL for it’s on going contributions, with out these regular and much needed funds coming in from EXETEL we would not be able to operate. 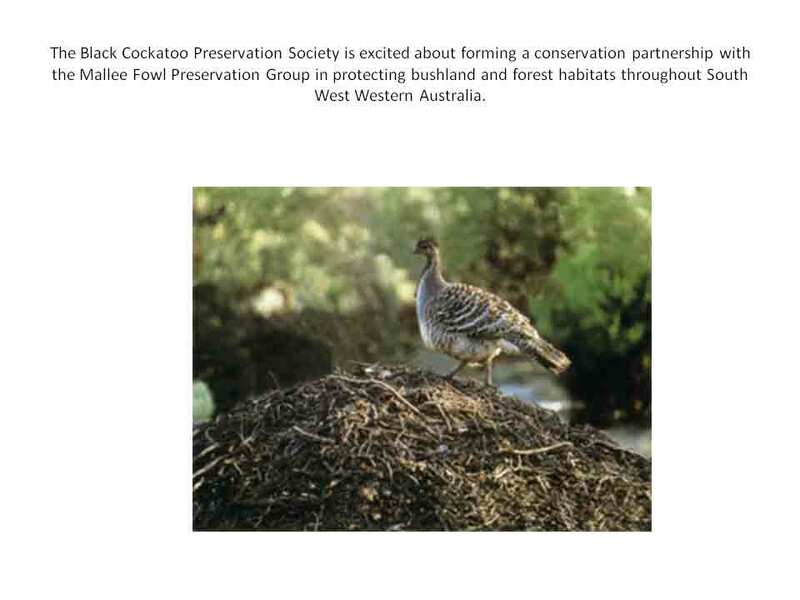 Direct Results of EXETEL involvement with the Black Cockatoo Preservation Society of Australia Inc.
1) Able to open the primary facility (Kaarakin). As a direct result of the kind donation from EXETEL we are able to meet the day to day running costs of the new 40 acre facility. This facility is the only such facility in Australia. We have contributed over 16,000 volunteer hours since the 19th November 2008, and this achievement has only been possible from EXETEL. 2) Rescue more endangered Black Cockatoos. We are now in a position to market ourselves better to the public; We have been able to provide education seminars to members of the public through displays and attending different talks; The support given to us from EXETEL has given us the ability to purchase education material which has had a direct result in obtaining much needed volunteers, who can do bird rescues and get the Black cockatoos to the Perth Zoo for emergency care in a timely manner. 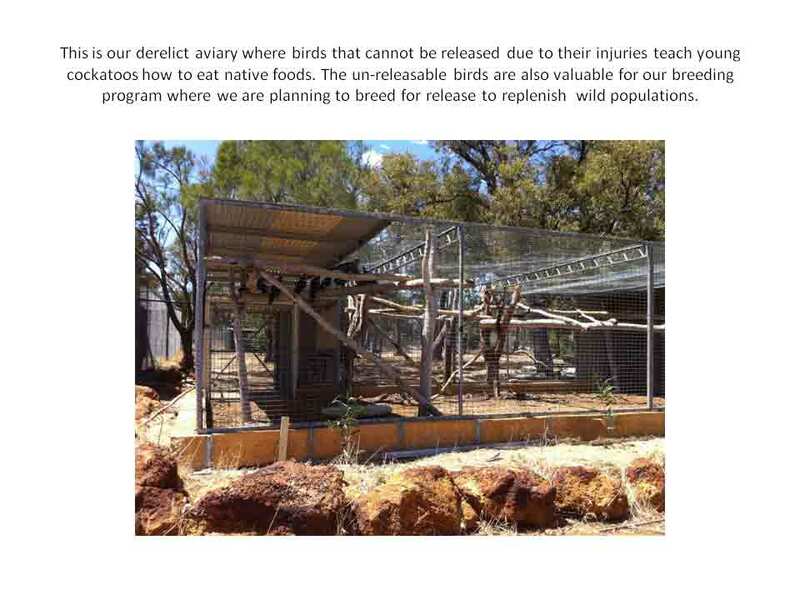 A notable result of this is the increase in the number of Black Cockatoos being saved and brought back to our organisation for care and release. Although we have a long way to go, more members of the public now know what to do when they find a black cockatoo. 3) Increase in release of Black Cockatoos. 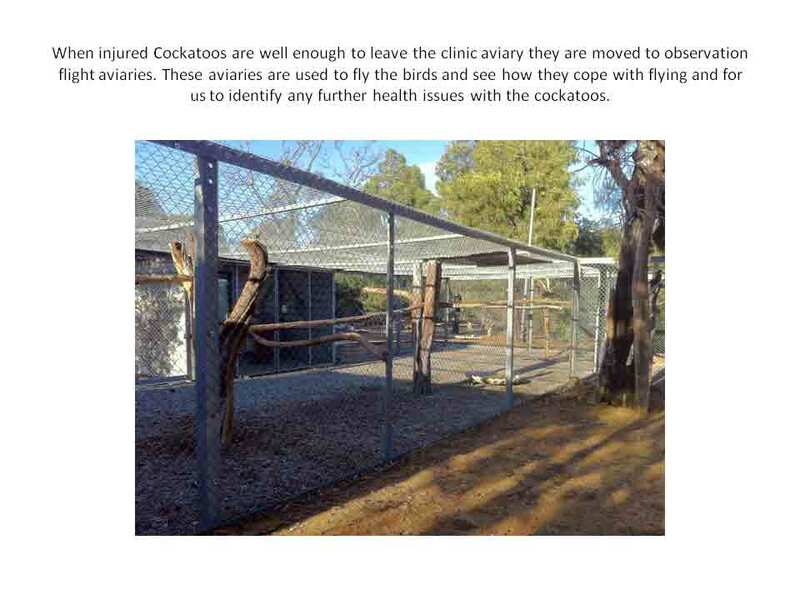 Since we have been able to rescue all birds that are reported in a timely manner, we are having our biggest year in reported injured black cockatoos. 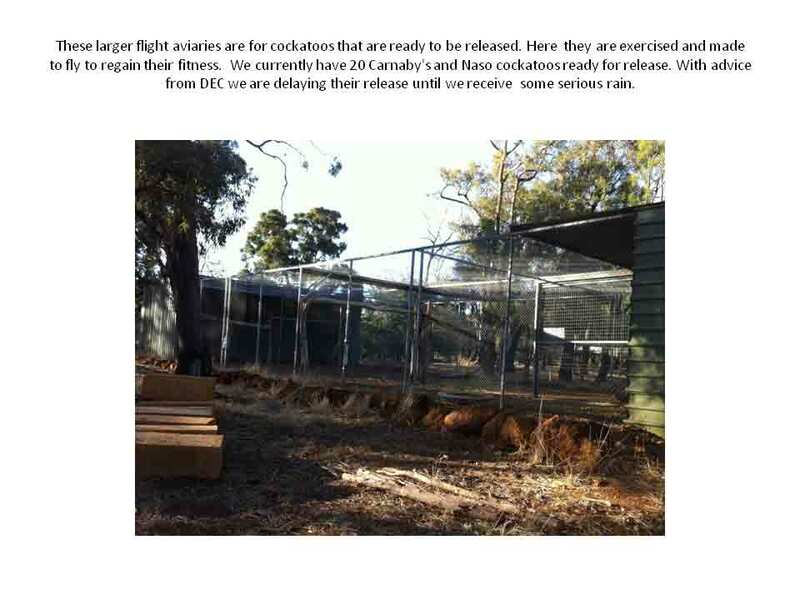 I am not sure if this is good, though having that ability to respond we have seen a significant increase in Black Cockatoos ready for release. July 2008 to September 2008 we only released five Black Cockatoos back into the wild, though the same time this year we have released 17 Black Cockatoos and by November we will have another 9 to release. I cannot stress enough that our organisation would not be where we are today and there would have been a lot more Black Cockatoos deaths without the support from EXETEL. Our vision and long time goal is to eventually open up to the public, and have an Endangered Native Species Park, the only one in Australia. Although this is a long way away, we are very mindful of this when we are planning and building our aviaries. 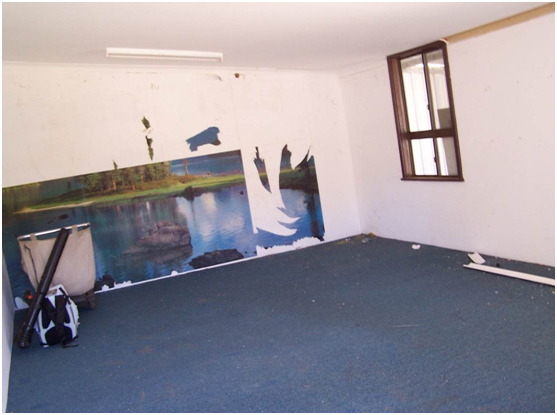 Though we have already followed EXETEL example in bringing the plight of endangered species to the public by converting a disused structure in to a Gouldian finch enclosure, where we can show case these endangered birds. Although we are not open to the public we do have a number of groups who visit Kaarakin including industry and government. The web-site has finally been finished but due to delays we have started another project and we will have to finish first before we can continue with the site. We have provided Shady with a considerable amount of video, of which we hope to put on the site, though we have to go through it with him as some of it is copy write. We hope to get this started by the end of November. This new site will be dynamic and is very much anticipated by a lot of interested parties. 1 ) Rescue, Rehabilitate and Release Black Cockatoos. 4 ) Coordinate approach to Black Cockatoos. 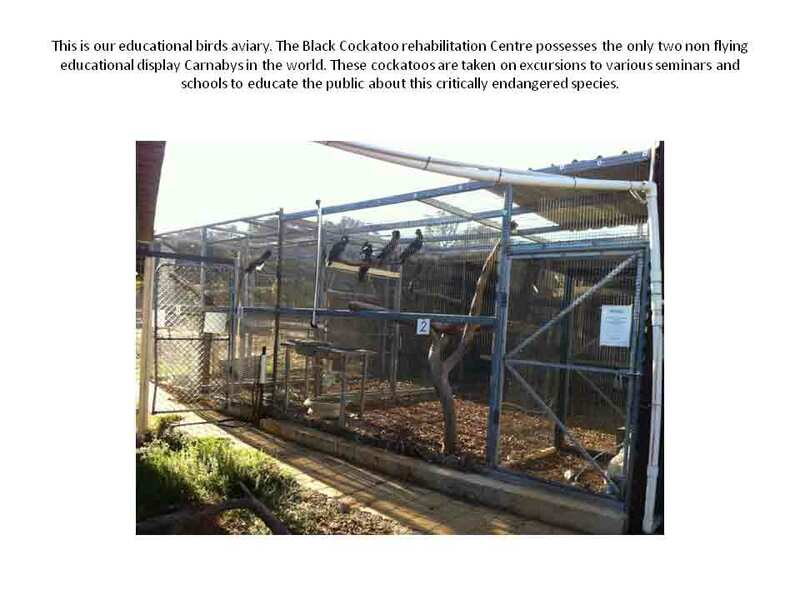 5 ) Provide an education and learning centre for the study of Black Cockatoos. 6 ) Provide a research facility in all aspects of Black Cockatoos. 7 ) Raise money and property for the preservation of Black Cockatoos. 8 ) Establish strategic partnerships with stakeholders. 10 ) To provide a coordinated approach to the management of Black Cockatoos. 11 ) To form MOU’s with key stakeholders. 12 ) To encourage sustainable development. I stated some time ago that our organisation is seen as world leaders and this was evident when we had a volunteer day. This day was organised to bring our volunteers up to speed on what is happening and our achievements. I expected approx 25 people to attend. We had 54 people attend and had 2 visitors from interstate who travelled to see why we have been so successful. We have also been contacted by other organisations within Australia and 1 over seas organisation to speak with them about our organisation and how we can help them to establish a similar cause. Although it is extremely stressful to take these small projects on, it is very encouraging to see the enthusiasm of these people for our wildlife; this is what inspires us on. We have started the Kaarakin Native Flora Group who has planted over 800 trees and bushes at our Kaarakin site, and we are well on our way to make example cockatoo and native wise/friendly gardens. These volunteers are very dedicated and are now at there planning stage to involve community groups in these activities. John I think you and your team will be very impressed with what we have achieved in such a small time. I cannot stress enough we will not be in the Kaarakin facility with out the support of EXETEL. The bottom line is, more birds are being rescued and treated as a direct result of EXETEL commitment. Forwarded for your information and favourable consideration. The Black Cockatoo Preservation has been extremely busy with record releases of black cockatoos to their families (inter-family release), learning more about their breeding habits, attending to over 37 displays to an audience of at least 8,000 people, attending to rescues, providing valuable information on saving their habitat, providing a quality environment for their stay at the rescue centre. 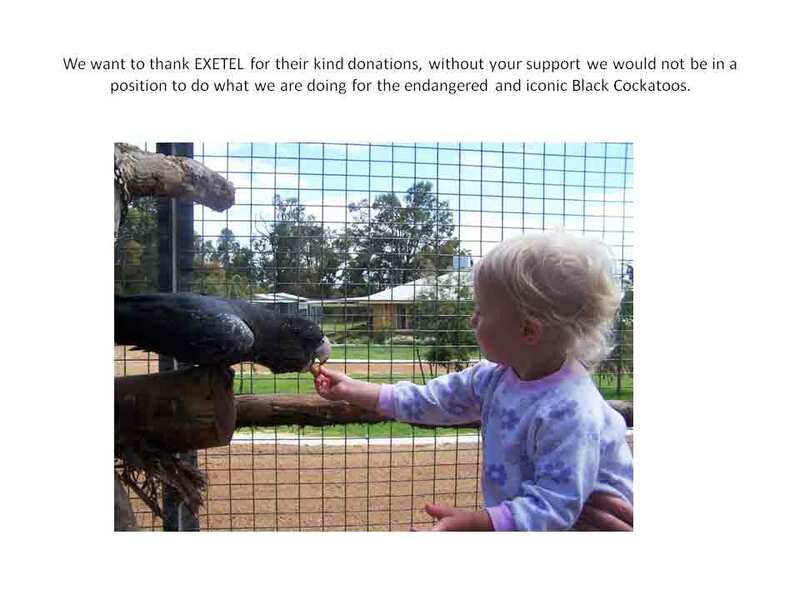 EXETEL has been involved in all these projects and with out EXETELS continued support there would be very little for the endangered Black Cockatoos to look forward to. 1)	In January 2010 over 200 Carnaby black cockatoos died as a result of a heat wave in Hope Town Western Australia. 2)	In February an unknown number of Carnaby cockatoos died as a result of fires in Toodyay to the east and Badgingarra to the north of Perth. No real number is known but an estimated 200 odd cockatoos perished. 3)	In March this year we had a storm over the Perth metropolitan area and more than 70 cockatoos were killed as a result. With the continued deaths around the metropolitan area and the surrounding bush lands the Cockatoos cannot keep up this rate in losses. Though we aim to change this through education and being smart. The good news is the though the society released 58 Black cockatoos this year which is 58 Black Cockatoos that would of never been alive today without he help of Exetel, volunteers and the Perth Zoo. On the 16th August 2010 28 cockatoos were released to the north of Perth metropolitan area which was the single largest release known of black cockatoos. The other 30 cockatoos were released into their family groups once they had recovered from their injuries. 10 years ago 43 cockatoos would equate to an average size flock, though in today’s standards this number equates to several flocks. Breeding Cycles: Unfortunately not all Black cockatoos can be released due to their injuries. If a cockatoo cannot fly better than 97% then they become a food source for the birds of prey. At Kaarakin (rescue centre) we spend a considerable amount of time studying the behaviour of these birds to try and make them useful for their own kind. Some are used as display and educational birds for the members of the public; others are used to teach wild cockatoos on how to behave in an aviary environment. Though we now taken this further and we are on our way to provide an ideal breeding environment for the Black Cockatoos. Although we have had limited success today and it is in infancy stage, we believe with our continued study and support for the creation of these ideal environment situations then in the future we will be in a position to release offspring into parts of Western Australia where the threat to the species is limited. This is very time consuming expensive though the only way we are going to save the species from extinction. EDUCATION: We have attended over 37 displays in the past 12 months (this does not include guided tours of the rescue centre) ranging from groups of 10 to catering for groups of over a 1000 in one day, educating any one who wants to listen to the plight of these endangered cockatoos, the work that we do and the support we are provided. As a result of this we have had more inquiries about cockatoos by people being more aware than ever before. The down side to this is I receive on average 60 emails a week (sometime 30 in a day) from members of the public from around the world. I always try and respond within 24 hours. However with a full time job and 3 little kids to look after and the organisation it gets very hard and tiring, though I am not perturbed. Rescues are for every increasing and this is a very expensive and time consuming exercise. We not only go to rescues of injured cockatoos but we try and get to all deaths as well. This is very important to try and determine why the cockatoos are dying. This strategy has led to reports of people poisoning the cockatoos and/or the fact that they are just starving. The most disturbing information we have gathered is the cockatoos are getting lighter in weight which is telling us food is simply not sustaining them in certain parts of our country. All cockatoos are micro-chipped before they are released, so it is very important that all deaths are recorded. The good news here is we have only had 4 cockatoos come back to us as deaths with microchips since 1998. We must be doing some thing right. Providing valuable information on saving their habitat: This is the most frustrating aspect of our work. All the real experts are saying the cockatoos cannot continue to loose their habitat. We are seeing first hand how light the cockatoos are, and just by going out there and witnessing their habitat, no wounder they are starving. We provide data and significant resources in time and energy studying different aspects of their habitat and Simple Simon can see that we are driving these birds to extinction. Yet it all comes down to greed. 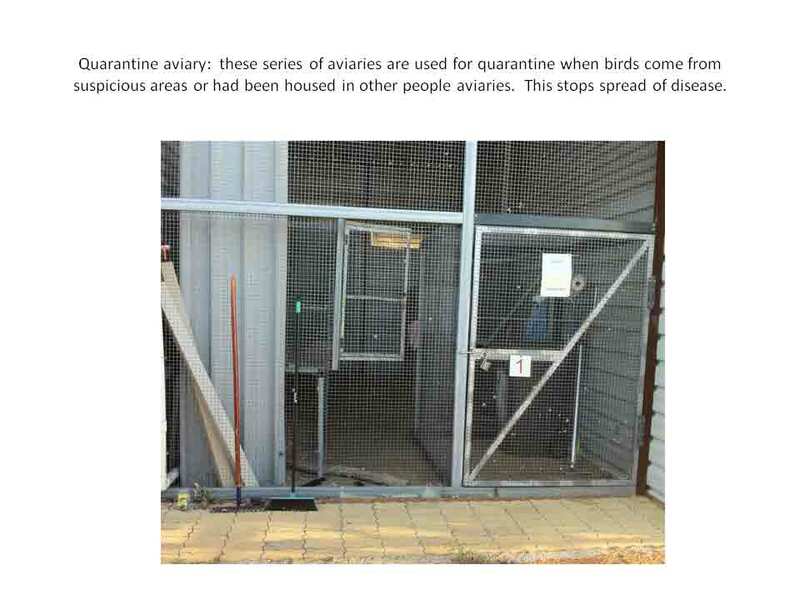 1)	It also does not help when the premier of the state of Western Australia, hates the birds with a passion and will not even entertain the idea of discussing the issue of their plight in the slightest way. 2)	The Minister for Environment, Western Australian Government supports nepotism with the Department of Environment and Conservation and made three very disturbing and purely wrong decisions about the cockatoos that has sealed their fate for extinction with the introduction of diseases that are not in these birds now. 3)	The Federal government refusing to give charity status to our organisation who deals with these cockatoos yet can give it to other organisations that don’t. 4)	The Federal government doing secret deals with developers and business to destroy the cockatoo’s habitat. Further they refuse to listen to the people who are actually working with the cockatoos. We now have a good team at the centre though we still need a lot more help. Lottery west has given some funding for a 12 month manager at the centre. This person will further grow this cause to something that no one has ever seen before, just wait fort he next 12 months. There is so much work to do; with out the help of EXETEL we would not even be at the cockatoo centre where we are today. 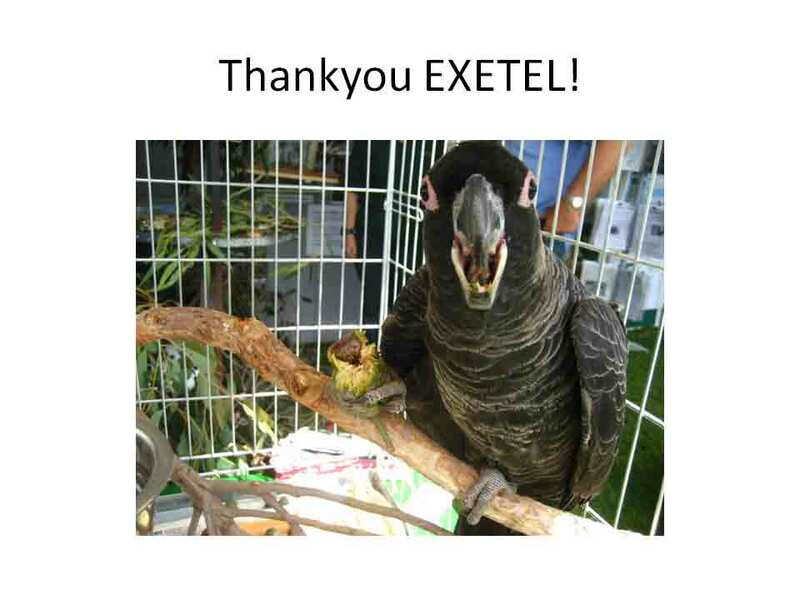 EXETEL support is vital to our survival and most certainly the survival of the Black Cockatoo as a species. How can EXETEL continue its support? By just being there and doing what you’re doing now. We just simply would not exist without the continued support we receive. Black Cockatoo Preservation Society of Australia Inc. The Black Cockatoo Preservation Society has been very busy rescuing, rehabilitating and releasing sick, injured and orphaned endangered Black Cockatoos since 1998. Since our group has moved to the new centre (Kaarakin) 2 and a half years ago we have been involved in over 600 Black Cockatoos including though not limited to the endangered Carnaby’s, Baudins and Forest Red Tail Black Cockatoos. During peak times the centre will admit on average 3 injured, orphaned or illegally kept Black Cockatoos per day. Many of the cockatoos that the centre receives have been illegally shot. In the past 12 months the centres volunteers have amassed over 16000 volunteer hours. The Kaarakin Black Cockatoo Rehabilitation Centre was established in 2008 by the Black Cockatoo Preservation Society at an abandoned wildlife park. 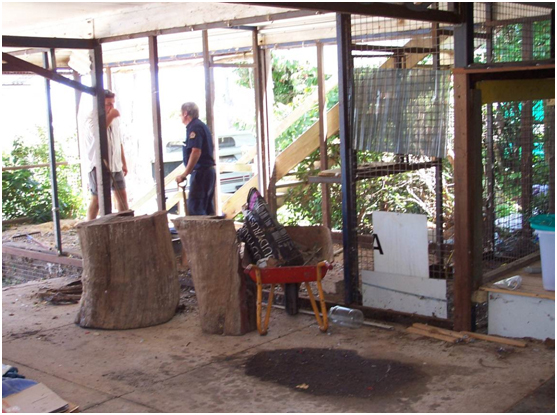 Since then volunteers from all walks of life have been busy repairing the infrastructure at the park and building rehabilitation aviaries to house the ever growing number of Black Cockatoos in our care. 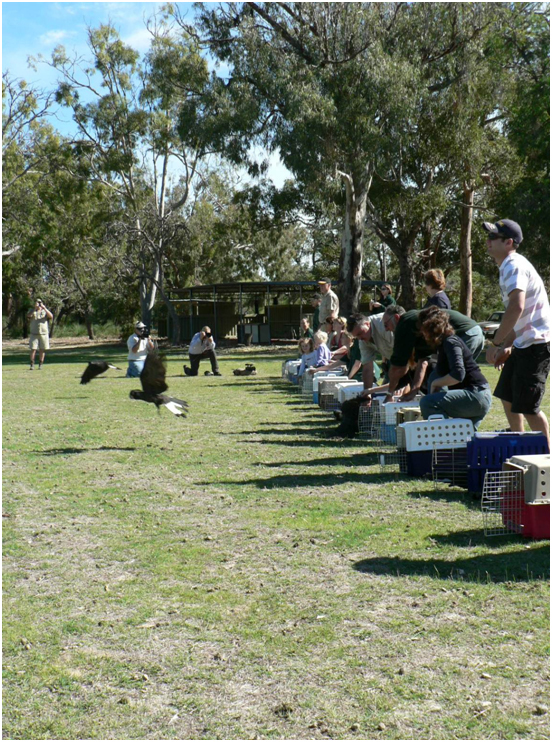 The Kaarakin Black Cockatoo Rehabilitation Centre’s main aim is to rescue, rehabilitate and release Black Cockatoos. Kaarakin also aims to provide breeding centres for Black Cockatoos to sustain the number of Black Cockatoos, educate the wider community on the plight of the Black Cockatoo and educate business, government and the public on the importance of saving the nesting and feeding grounds of the Black Cockatoo. Finally, Kaarakin aims to enlist the help of the people from Western Australia and establish partnerships with business, government, other environmental groups and the public to benefit the Black Cockatoos bleak outlook into the future. Though saying this we have many international volunteers who help the plight of the black cockatoo. Since 2007, at least 600 Black Cockatoos have been rescued, and more than 130 birds have been rehabilitated and released into the wild. In 2011, a new educational program was written and has been delivered to educational institutions throughout the metropolitan area, including schools, businesses and other community groups. Kaarakin has developed relationships with at least 26 private and government organisations. The Australian Threatened Species Centre, Perth Zoo, City Of Gosnells, Volunteering WA, City of Armadale, Cockatoo Coalition, True Unna Aboriginal Cultural Org, Community Vision, WA Dingo Association, Dept. of Corrections and a range of educational institutions. With an improved national network, Kaarakin is better placed to receive information in relation to Black Cockatoo welfare, and greatly improve the chance of survival for these species under threat. In kind donations from various companies in the past 12 months for building material and hire of machines has equated to just over $600,000. Though without the support from EXETEL and those who support us financially we would not be in a position to actually go and monitor feeding grounds, conduct rescues or track flocks down to released rehabilitated birds back into their flocks. Kaarakin has forged a relationship with Karnet Prison Farm; volunteer prisoners supply skilled labour for ground and aviary works on site. In 2010, volunteer prisoners supplied 8000 hours of labour, and this is going to grow for 2011. 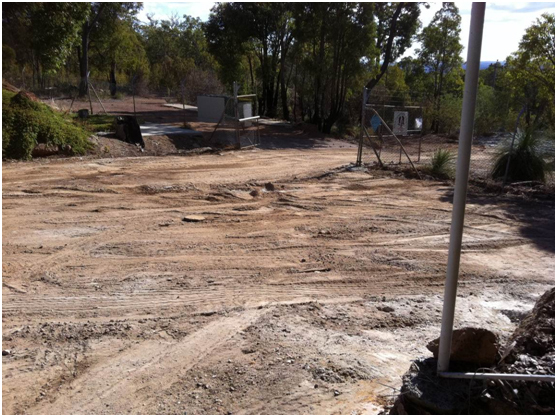 The site that Kaarakin sits on is an abandoned derelict wildlife park. This means that a lot of extra work has been put into making the site safe for volunteers and the public to access. Along with the wildlife park, several emus and approximately 100 kangaroos and wallabies were inherited. Management decided to not euthanase these animals, but instead put the extra effort into obtaining support and sponsorship so they can be fed. The volunteers and management at Kaarakin have consistently offered a high level of care to not only the Black Cockatoos on site, but the other native species needing specialised care; emus, kangaroos, dingoes, Australian birds and waterfowl. Often, volunteers and staff take baby birds home that need around the clock feeding and care. The founders of Kaarakin put extra effort into researching Black Cockatoo family groups. To this day, when a bird is ready to be released, volunteers or staff will seek out that bird’s family group so they can be reunited and have a greater chance of survival. Talks are underway with the relevant stakeholders to turn the southern region of the Banyowla Regional Park, including the Kaarakin site, into the largest metropolitan wildlife sanctuary in Australia. 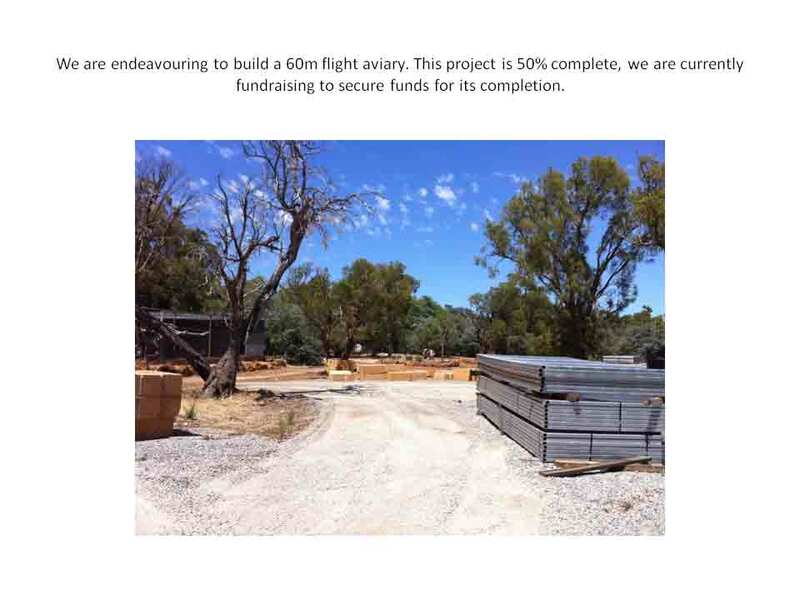 The staff and volunteers at Kaarakin are moving beyond rescue for just Black Cockatoos, we aim to house birds, mammals and reptiles at the Australian Threatened Species Centre in the near future. 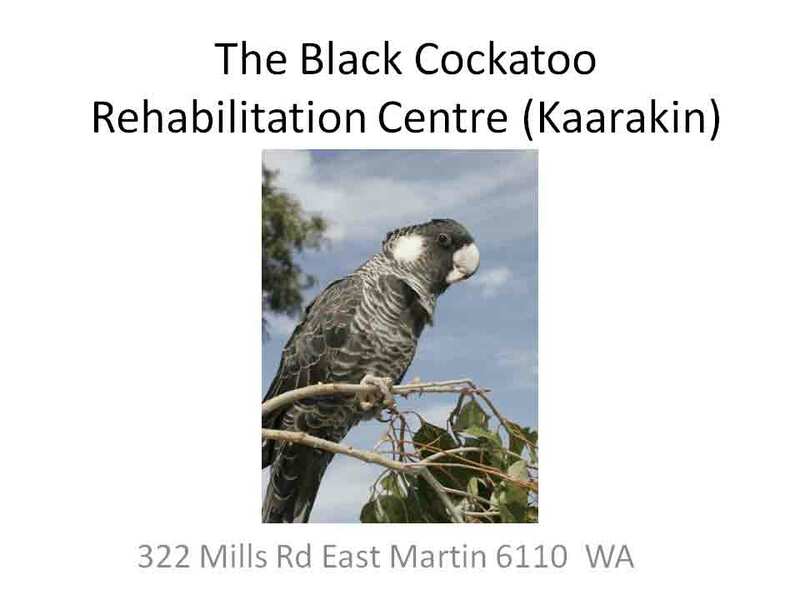 The Kaarakin Black Cockatoo Rehabilitation Centre could have just remained a small place that some people knew about, and only a minimal amount of injured birds were admitted. Staff and volunteers have put in the extra effort to advertise the centre’s aims and objectives, forge partnerships with companies and government, and put Kaarakin towards being a premier location for threatened species. There are three species of Black Cockatoo found only in the South West of Western Australia; Carnaby’s, Baudins and Forest Red Tail. At Kaarakin, all are admitted as well as other sub species of Black Cockatoo found in WA. As previously mentioned, more than 130 Black Cockatoos have been rehabilitated and released, as opposed to dying on the side of the road. For these threatened species, each with potentially as little as 8000 birds left, any birds that can be saved are significant. Educational talks have been delivered to schools, universities, industry and community groups both on site at Kaarakin and travelling outreach. The effects have been a significant increase in awareness, enquiries on how to build nest boxes and even projects revolving around the Black Cockatoos. Anecdotally, people have mentioned that they are less likely to shoot the birds (their loud calls are ‘annoying’), more likely to look out for them feeding near the road and more likely to bring injured birds to Kaarakin instead of leaving them to die. The down side to getting more exposure, if you could call it a down side, we are travelling approximately 550 + kilometres every week in cockatoo related rescues and/or specialised veterinary care. This is a very expensive exercise if it was not for the goodness of EXETEL and our volunteers who continuously put their hands in their pockets each month, we simply would not be able to reach as many birds as we do. We currently have 3 centres across the south west of the state and hoping to open a further 3 by the end of 2012. This will limit our travelling costs and stop veterinarians putting the cockatoos down as there is simply no one to care fort hem. 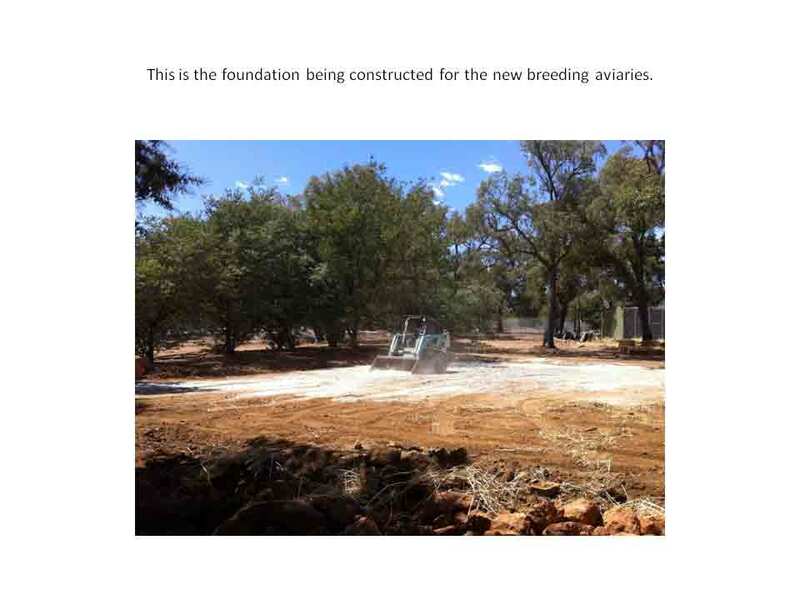 With better focus this year on site management, partnerships with business and government, Kaarakin is building new aviaries and has more resources to cope with ever increasing amounts of Black Cockatoo admissions to the hospital. We don’t like the fact some of the birds will never be released due to their injuries but what we have done is putting them to good use and get them to breed for release. We are always looking at better ways in protect the birds in our care. In 2011/2012 The Black Cockatoo Preservation Society has secured $40 000 from DEC to develop and deliver a world first Black Cockatoo education program to the public, industry, universities and other government departments. This money is also being used for a major revegetation project with the Banywola Regional Park to create a native botanical park with an emphasis on planting food for the endangered Black Cockatoos. With the addition of our new general manager, Chris Phillips, the BCPS is now ideally placed to achieve the goals and missions of the society and further protect the black cockatoo from a catastrophic population crash. Since Chris has come on board in January 2011 he has brought awareness to over 8,000 people and has been instrumental in eradicating weeds in regional parks and planting over 10,000 trees for cockatoo habitat, this year so far. We have been approached by other small organisations for assistance though we cannot give them financial assistance we give them knowledge support and as a result have incorporated the Australian Endangered Native Species Centre, so there can be a centralised approach to the problem of species extinction. There is a lot more we need to do and we have a 5 year plan, if we do not change the mind set of government and industry we will lose the black cockatoo on the swan coastal plain shortly never to be brought back again. This will follow with other black cockatoos around Australia. We only have funding from Lotteries West for 12 months wages for Chris who lives on site with his young family. If the Black Cockatoo Preservation Society does not get a significant donation soon we will not only lose Chris and his expertise but the awakening of a very important movement in saving not only the endangered black cockatoos but other endangered species will be lost forever, as each day is a day of countdown to the point of no return. As an organisation we would not be here without EXETEL, the donations given to our organisation goes directly to the core of Rescue, rehabilitate and release, this has now grown to rescue, rehabilitate, Breed (from those who can’t be released) and release. Work Begins on damaged and dilapidated infrastructure. 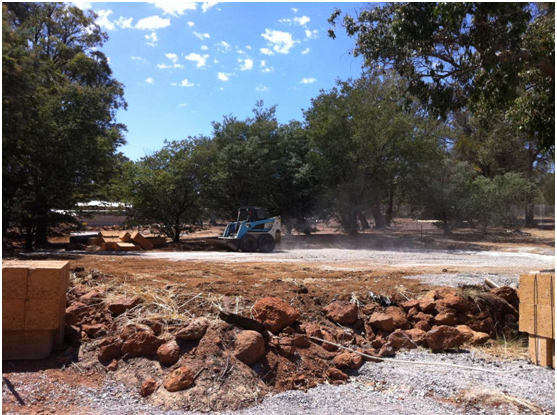 Work begins on the Black Cockatoo Specialist Vet Clinic previously a room used for bottling onions. 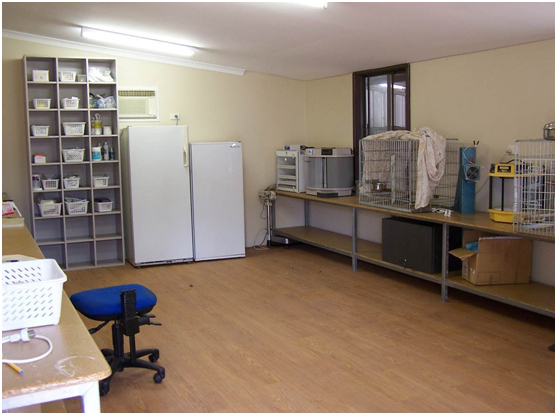 Stage one of the finished Vet Clinic. 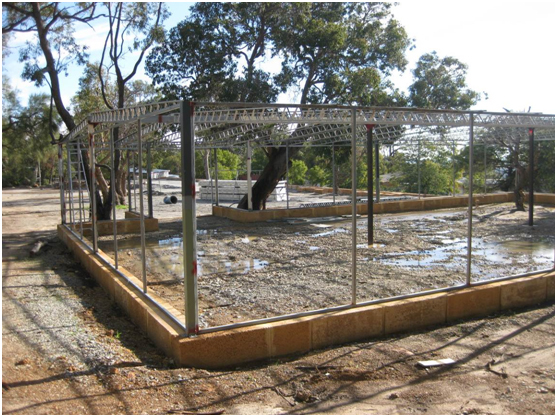 Work Begins in 2011 on the Worlds only Black Cockatoo breed for release aviary. Partially completed Breed for release aviary. The main car park at the Black Cockatoo Rehabilitation Centre before work started. 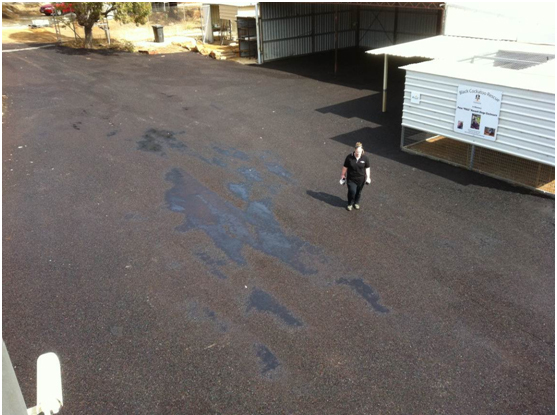 The main car park at the BCRC after it had been resurfaced with recycled and reclaimed bitumen, volunteer labour and donated machinery. 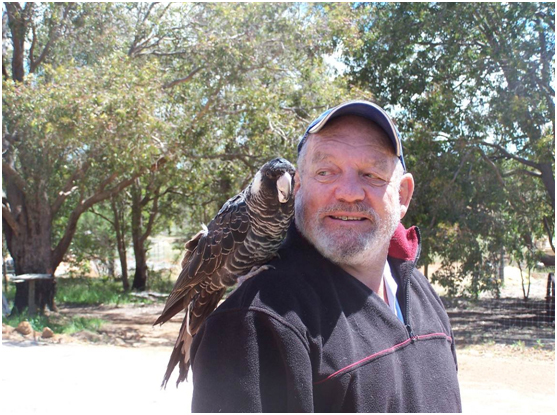 Bill Dewhurst, a world expert in Black Cockatoos with one of his many patients. Release day. After the birds are successfully rehabilitated and returned to full health they are release back into the wild!